The MFSC fully supports the SafeSport program. 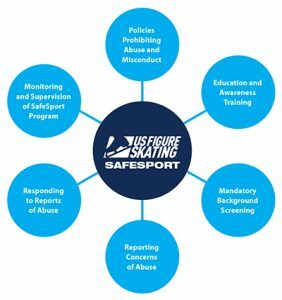 Our compliance chair will monitor the SafeSport policies and procedures of the club; verifying that all of the coaches who are engaged in any type of coaching activity with any club skater are in compliance with the USFS coaching membership rules regarding background checks and continuing education requirements. Any suspected misconduct should be reported to our MFSC SafeSport Compliance Chair at safesport@mentorfsc.org or any MFSC board member. Other policies that are approved by our board will be posted as they become available.